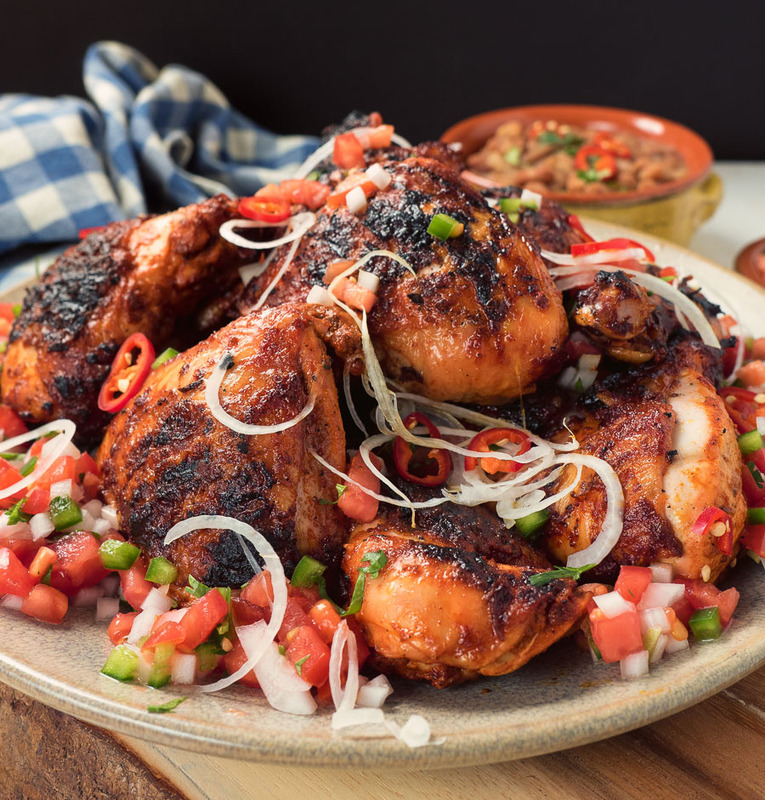 Yucatan grilled chicken. A little bit of sunshine next time you grill. Big, bold, bright tastes. Citrus. Achiote. Chili. Mustard. Garlic. What’s not to love? It’s dead easy as well. Just combine all the ingredients in the blender. Marinate the chicken. Grill. Smile. This is the stuff of roadside Mom and Pop grills in Southern California. El Pollo this or El Pollo that. If you’ve been, you know what I’m talking about. If you haven’t – just make this. It’ll be like you were there. It is absolutely addictive stuff. Even when it’s bad, it’s pretty good. And when it’s good, it’s awesome. If you don’t live close to Mexico you will need to make a trip to a latin market. The secret ingredient is a paste called Achiote. It’s pronounced “achot” so if you have to ask for it try to say it that way. So they won’t look at you like you are crazy. It has annatto seed in it. That’s the stuff they use to colour cheese. You think turmeric stains? Watch out. Don’t say you weren’t warned. Grab a pure chili powder like New Mexican while you are there. Grab lots. Not just for this recipe. Pure chili powders are just so much better than the crap called “chili powder” in grocery stores. That’s a blend of spices. Doesn’t matter what you cook with it. It all winds up tasting the same. Just not good. Once you have that, the rest is easy. Some garlic, some citrus. Some mustard. Puree it all up. Toss the chicken in the marinade. Let it sit for a while. And then grill. This is skin-on chicken. Plan for an indirect fire. You don’t want to be fighting major flare-ups. Finish it direct to get a bit of char. Charcoal is true to the Mom and Pop grills. When you taste their Yucatan grilled chicken you’ll know it’s true. Gas will do – just won’t have the depth of flavour. Maybe plan for some wood chips if you’re cooking with gas. 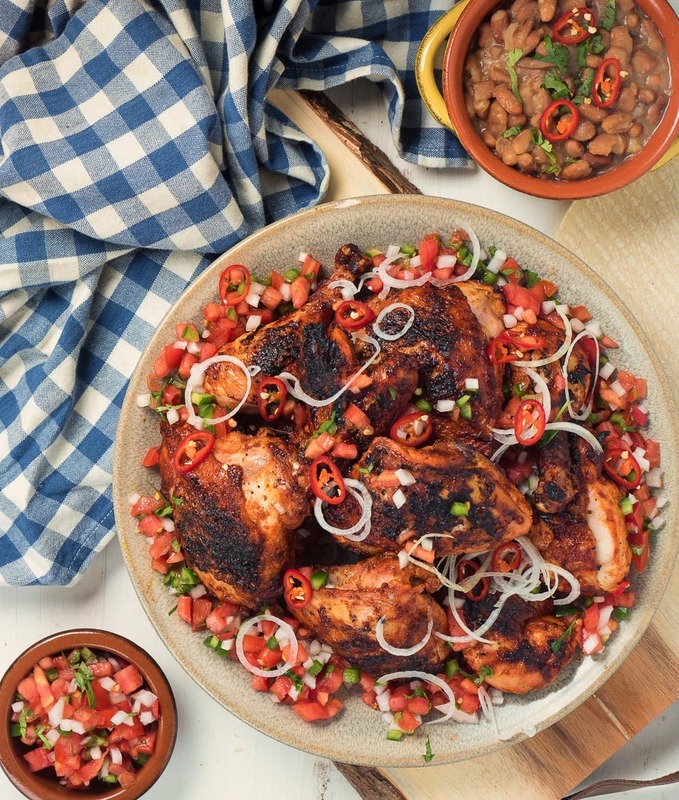 Try Yucatan grilled chicken next time you’re planning a party. Maybe some tortillas and pinto beans on the side. Your guests will love it. 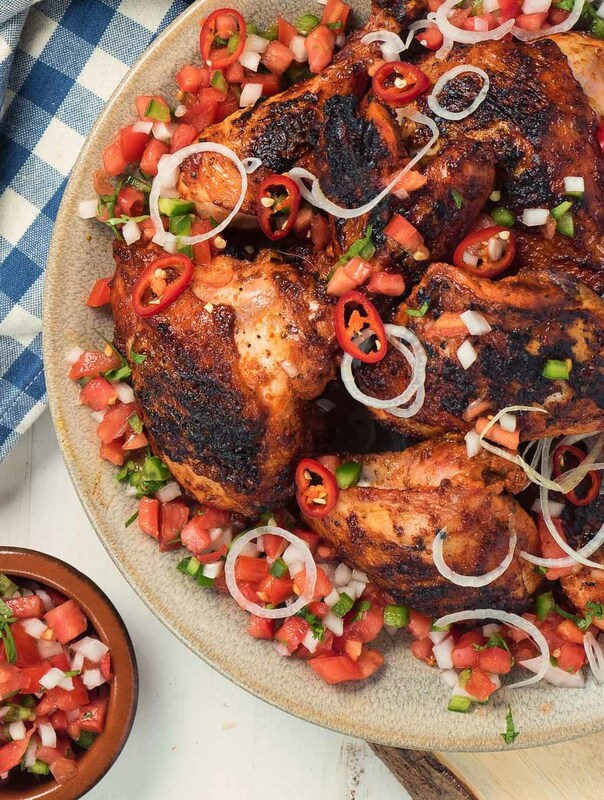 Yucatan grilled chicken tastes of summer on the grill. It comes together in no time flat and may be some of the best grilling you will ever try. Combine all the ingredients except the chicken in a blender. Puree until smooth. 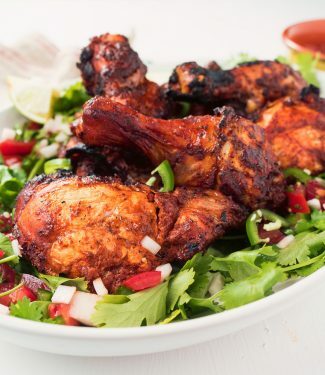 Place the chicken and marinade in a non-reactive dish and let stand 1-3 hours. Prepare your grill for medium-high indirect heat. Place a drip pan over the portion of the grill not heated to catch the drippings. If you are using a gas grill, place some pre-soaked wood chips in a foil packet and pierce. Place the foil packet over a lit burner. If using charcoal build a banked fire on one side of the grill. Place the drip pan on the other side. Grill, indirect, until an instant read thermometer reads about 155-160F. Start rotating pieces over the direct heat (2 or 3 pieces at a time) to get a bit of colour or char. Once they have coloured up, return them to the indirect area. Repeat until all the pieces are done. Pay close attention when you do this. Continue cooking until an instant read thermometer reads 165F in the thickest part of the chicken pieces. Serve with pinto beans, tortillas, and pico. Achiote paste is a bright red seasoning from Yucatan. It stains like crazy so be careful when you use it. You can find it at Mexican and Latin markets. I use El Yacateco brand. In bbq and grilling, main course, mexican, poultry. Bookmark the permalink. Albert, I’m so glad you liked it and thank you for taking the time to comment! Annatto is famous for staining everything! Hope you find time to pull your grill out before the snow flies.